home → Loans → Loan Basics → How Do Interest Rates Differ between Motorcycle Loans and Car Loans? How Do Interest Rates Differ between Motorcycle Loans and Car Loans? Interest rates tend to be higher on longer loans, and motorcycle loans are often not very long. For this reason, motorcycle loan interest rates can be lower than auto loan interest rates. Unfortunately, however, there are several factors that can make the interest rate on a motorcycle loan equal or exceed that of a car loan. For the most part, a lender does not need to charge high interest rates on a short loan. Interest rates go up to compensate for two primary factors: risk and inflation. Shorter loans carry less risk of default for a lender. They present a lower chance that a borrower's financial situation will change unexpectedly, forcing a loan into default. High monthly payments on short loans mean the lender makes the principal sum back faster, further lowering risk. Shorter loans also carry less risk of inflation for a lender. Over time, inflation nearly always rises, with the only exception being short periods of stagflation or deflation. With a long loan, the lender must account for the fact that inflation will make payment on the loan less valuable the longer the loan is alive. Motorcycle limits tend to be lower than car loan limits. This makes it easier for a borrower to take a short motorcycle loan, counteracting the threat of high rates. The rates will stay low if a borrower has a strong financial standing. However, for a borrower with a less secure financial base, the rates on a motorcycle loan can get very high. 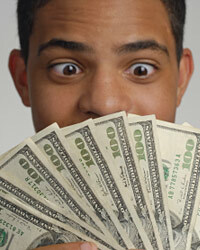 The first factor to determine for most lenders is how much debt the borrower already has. Most motorcycle owners also have a different, primary vehicle they operate on a daily basis. If this vehicle has a current loan, particularly if the loan is large, the motorcycle lender may become worried. Most borrowers will place their auto loan in a higher position of importance than their motorcycle loan. This means that if the borrower must default on one of the two, he or she is likely to allow the motorcycle loan to go into default first. Motorcycle loan rates will be higher if a borrower has a standing auto loan as a result of this risk. The biggest factor in motorcycle loan rates compared to auto loan rates is the type of financing used. Borrowers are more likely to use a traditional loan from a bank for a car loan than a motorcycle loan. Motorcycle loans often come from alternative lenders, such as a manufacturer's credit card. These credit cards can be used to purchase the motorcycle at 0 percent interest for a short period of time. Unfortunately, the rates skyrocket from the initial no-interest period. The rates on loans secured from motorcycle dealers and manufacturers can be as high as twice the average car loan interest rates. A borrower who stays with traditional forms of financing is more likely to get a fixed rate, but it can be hard for a high-risk borrower to get a motorcycle loan from a bank.